Mind Loop, a solo exhibition by Ashley Whitt, explores the inability to escape certain memories o r thoughts in one’s mind. Through self-portrait and still life photographs, large wallvinyl, GIFs, and sculptural handmade books, the artist aims to interpret and make sense out of the absurd. Inspired by Surrealism and Dadaism, Ashley Whitt seeks to subvert the viewer’s perception of reality and the rational. These images and moving stills aim to rationalize the irrational and turn the viewer’s perception on it’s head. 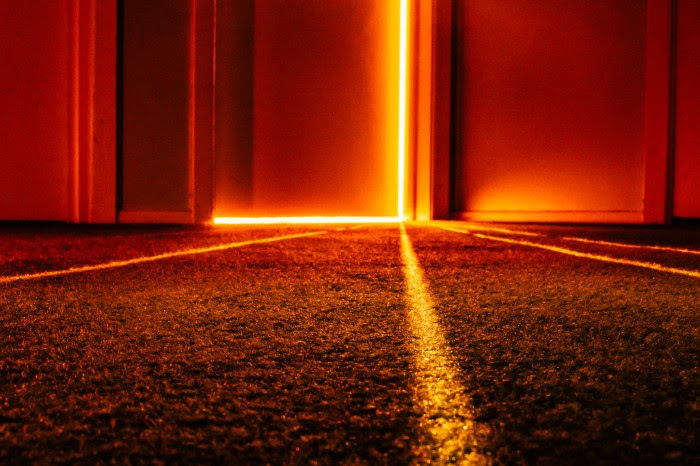 Whitt invites the viewer to become immersed in an optical illusion. These illusions serve as metaphors for the absurdity we face in everyday life. existence. These images were photographed with 4x5 black and white film and painted digitally to illustrate the “Over-Soul” that connects man to the land. This process is also used to emphasize the romantic and idealistic qualities of the landscape to encourage the appreciation and respect of the audience. The resulting images depict surreal, dream-like environments that reflect these themes and question the audience’s perception of reality. Though this work reflects my personal beliefs regarding the importance and the sacred nature of the land, the ultimate purpose of these idealistic depictions is to encourage appreciation and respect for the earth and to provoke the audience to reflect on their own personal relationship with nature. 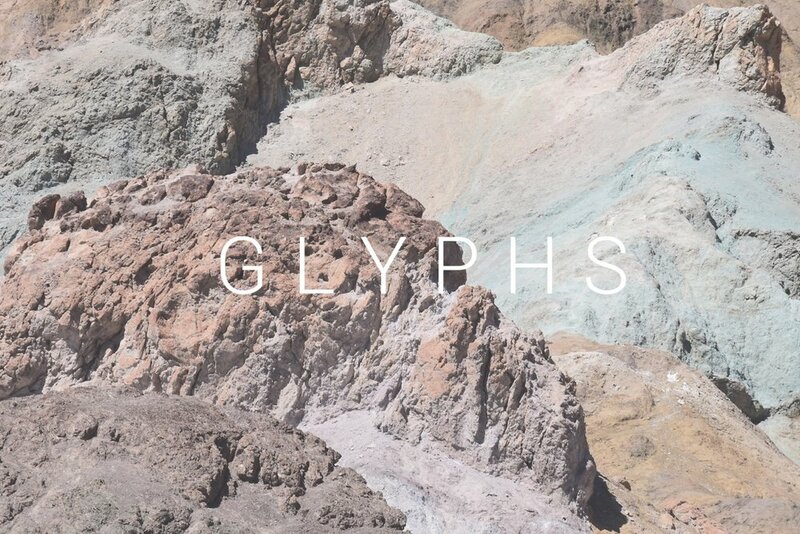 GLYPHS is an exhibition of photography, drawings, and sculpture from recent TCU MFA graduate Audrey Travis. This collection of works, displayed in the downstairs project space of 500X, addresses landscape, materiality and mark making. Extended Play is a collaborative exhibition by Ry Mccullough and Steven Foutch. The show explores a forced intersection of working methods derived from a series of informal conversations related to printmaking, art, and music. The show explores orthodoxy and experimentation within the historical language of printmaking. False Mercury is a continuation of Cravens' exploration of the body through distortions and duplicates. In this installation, she utilizes mirrors and origami to jumble the body and question the barrier between the physical and mental. Segmenting and focusing on different body parts, Cravens creates abstract origami sculptures that show the multiplicity present in our physical forms, and the disconnect with our mental selves. Through the use of mirrors, she invites the viewer to perceive themselves, layered within the carefully constructed compositions. Literally reflecting on where one begins and the other ends. Lynné Bowman Cravens is a fine art photographer, making unique pieces from an infinitely reproducible medium. Through meticulous physical distortions and transdisciplinary techniques Cravens creates photographic pieces that address her personal experiences, identity, and physical form. Each piece and series range from large-scale digital installations to delicate one of a kind objects. Cravens currently resides in the DFW area, orking as the Gallery Manager at The Art Galleries at TCU. She s in her second and final season as a member of the artist run co-op, 500X Gallery in Dallas, Texas. Her work was also featured in the June 2016 issue of the British Origami Society’s international publication, and in the 4th annual Rising Stars exhibition at Turner House. Cravens recently had a solo exhibition of her work in Fort Worth at the Moncrief Cancer Institute. Verisimilitudiness is the quality of having the appearance of being true or real. It’s not a real word, but just wait. Kalee Appleton’s solo exhibition, Verisimilitudiness, is the last and final exhibition by Appleton at 500X Gallery, so naturally it will be the most verisimilitudinessy of them all. The work being exhibited will indeed be based on truth (its photography after all), but in reality, its full of lies. Not little white lies, but big huge enormous lies that pull you in and seduce you. These huge lies are in the form of broad expansive landscape photographs that are inspired by mainstream photographic backdrops. Yes, the kind you had your photograph taken with as a youngster. As this description of the exhibition might indicate, this work also calls into questions the nature of fine art photography within the realm of the art world. 500X Gallery presents the two-person exhibition, Constructing the Psychographic, by H. Jennings Sheffield and Chris Ireland April 14th – May 6th, 2018. In 2014, Cambridge Analytica obtained information from over 250,000 Facebook users. Focusing on the Facebook “likes” recorded by those users and their friends, Cambridge Analytica utilized this data and information to help influence the outcome of the presidential election. This collaboration represents the physical manifestation of data retrieved and collected over 7 days from the artists’ Facebook feeds. The data mined is presented as wallpaper, creating a physical space made of virtual information. Then the artists utilized a psychographic survey application developed by the University Cambridge designed to predict personality traits through Facebook content, and ran their own Facebook pages and feeds to gain “insight” into their own personalities. Constructing the Psychographic presents the nature of the digital footprints we share so freely on the internet, and questions the validity of constructing identity through the individual profiles created. H. Jennings Sheffield is a lens-based artist and Assistant Professor of Photography at Baylor University. Chris Ireland is an artist, 500X gallery member, and Associate Professor of Art at Tarleton State University. “The Gravity of It All”, pairs the work of Abby Sherrill and Tabatha Trolli in an exhibition interpreting each artists’ experience of time and space. Both Sherrill and Trolli work with combinations of found objects and mixed media drawing through installation, with an interest in exploring the perception of meaning. Sherrill’s interests lie in the philosophical and psychological spaces between learning, language and reality. Often through illusion and layered pattern, the work emulates the accelerated complexity of deciphering meaning in a fictive world. Sherrill uses symbols and terminology borrowed from the laws of physics to cope with feelings of anxiety and disorientation. Trolli’s relationship with objects is connected to how she interprets the body, the emotional self and human consciousness. Casts of interior spaces are quiet references to our relationship with time and space and how we choose to occupy them. These ghosts of spaces become inflated memories and meaning that displaces our obligation to be present in this moment. These objects are abstract representations of mindless ritualistic behavior suggesting paranoia or altered perceptions. They become disruptions in the routine…the mundane…the accepted. Nearly a quarter of all violence committed against the Lesbian, Gay, Bisexual, Transgender, and Queer (LGBTQ) community involves physical or sexual violence. Country of Equality Brutality, a solo exhibition of printmaking, installation, and drawing, explores themes of brutality while raising awareness of the rising statistics of violence against the LGBTQ community by providing information to inspire people to enact positive change. Straddling the line between figuration and abstraction, my work focuses on an individual’s experience after or during specific hate crimes. Through my pratice, expressive mark making and the idea of the multiple give an identity to these victims. While these acts of violence last a lifetime for the victims, the public’s perception of these acts are brief. Often these crimes are not even reported by individuals due to fear of being outed publicly. Each piece has a different level of information to access, further allowing the viewer to understand the broad scope of these crimes, while offering a glimpse into these realities. Language plays a large role, referencing redacted police reports, hate slurs used by offenders, and victim testimony to communicate all facets of these experiences. Referencing service announcement posters, the scale of these prints offer accessibility and opportunity for a call to action, while expressing the prevalence of these crimes. Printmaking’s history of dissemination and political activism serves as a platform for the LGBTQ community. My goal is to create a dialogue, and raise awareness on these rising statistics, to allow for change in current legislature and the reevaluation of the reporting procedures within institutions on hate crimes. Juried by: Katherine Brodbeck, Assistant Curator of Contemporary Art at the Dallas Museum of Art..
500X Gallery, Texas’ oldest, artist–run, cooperative galleries, hosts one of North Texas’ most anticipated annual student juried competitions. 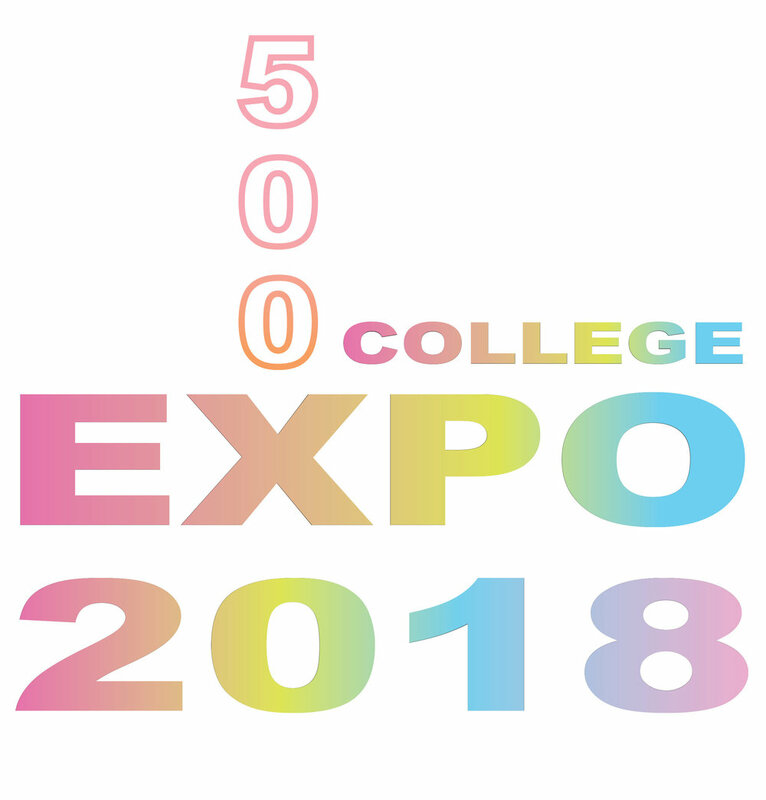 College Expo 2018 is open to all artists over the age of 18 living in Texas, who are currently enrolled as students. Ashley Kauschinger’s series The Rise & Fall of Woman investigates women’s history through still lives, projections, and performative shadows. The series explores the history of events, female figures, violence against women, and the evolution of patriarchal systems. Ms. Kauschinger is an artist, founding editor of Light Leaked, and professor at the University of South Carolina. Ashley Whitt's self-portrait series, After Her is inspired by the self-portraits of great women artists, including Claude Cahun, Ida Kar, and Francesca Woodman. Constructed as GIFs, large-scale wall vinyls, and handmade sculptural books, these works consider the past, present, and possibilities. Ms. Whitt is a Dallas-based artist, 500X member, and Lecturer at TCU. The photographic series Exposed uses visual imagery to unveil the reality of mental illness in an effort to wrestle with the stigma faced in society by those who suffer from these disorders. By highlighting personalized narratives of the struggle with psychological illnesses the social stigmas and reactions are divulged through this body of work. Each image in this series depicts an individual afflicted by such conditions as bi-polar disorder, PTSD, schizophrenia, addiction or depression illustrated through symbolism and metaphor. The work challenges viewers to look at the images and question their own reactions and opinions when it comes to mental illness. Are some relics so foreign to our psyche that they appear to be from the future? 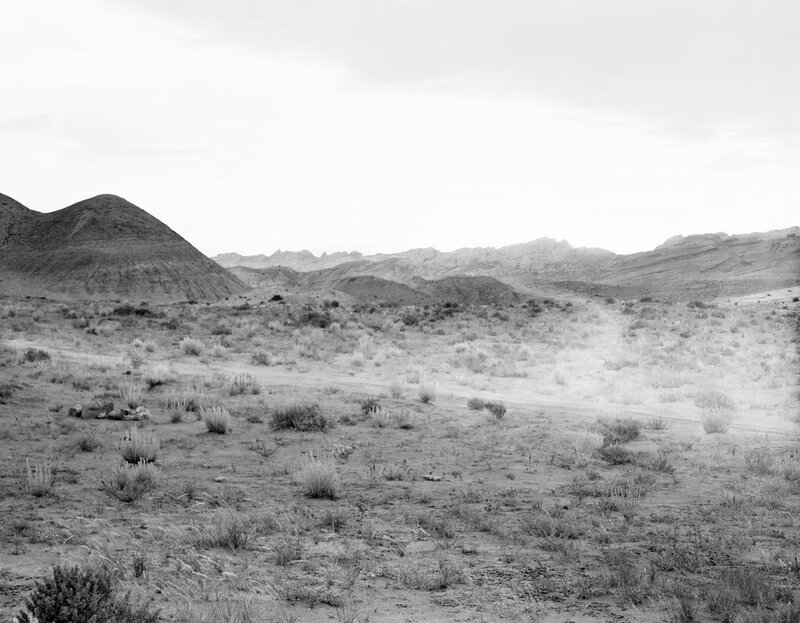 What affect do landscapes and materiality have on our understanding of ourselves and culture? Do symbols and archetypes have autonomy? Select new sculptures by Clint Bargers address these questions surrounding collectiveconsciousness, mythology and materiality as they relate to the western American landscape. Steven Foutch’s solo exhibition, Hemming and Hexing, explores a vague psychological space through narrative suggestion and the technical language of printmaking. The work is an exploration of mental clarity and cloudiness through landscape. Imagery is intended to evoke a discussion of terrestrial vs celestial vs psychological space. From where do mental objects arise and what if any narrative purpose do they contain. The presentation and framing devices are a more considered, sculptural vehicle for works on paper. In addition to questioning the boundaries between presentation and art object, the display method hopes to push the ephemeral towards the sacred. Chris Ireland’s solo exhibition Ordinary Time explores the psychology of ritual in the artist’s family though photographic studies spanning the last 10 years. Through loss and change, the photographic diptychs highlight the daily patterns and rhythms of life that do not disappear but adapt to changes in the family dynamic. Paperwork features works on paper inspired by doodles and daydreams while attending a wide variety of Art Professor-type meetings. Jessica Burke is a Georgia based artist and Associate Professor of Art and Georgia Southern University. Valerie Powell is a Texas based artist and Assistant Professor of Art at Sam Houston State University. Car·a·pace is a site-specific installation and collaboration between printmaker, Jessie Barnes, and Photographer, Lynné Bowman Cravens. Car·a·pace explores tropical landscapes and foliage, focusing on the immersive experience of being engulfed in such a dense environment. The project stemmed from a trip to Panama, and presents recollections of thick air and entangled native species. Such darkly alluring and exquisitely lush surroundings provoke us to consider relationships between the land, fauna, flora, and self. The definition of the word adjunct is: a thing added to something else. The adjunct professors in our DFW community are diverse and studious additions to our university arts programs. This December, 500x Gallery has selected a group of artists who balance their studio time with the demands of a teaching. sensation of being carried by a force greater then yourself. maps both physical and psychological journeys navigating the space between disaster &amp; hope. contemporary archetypes of feminine longings found in literature, film and life. Tabatha Trolli’s solo exhibition, Pass Through Me, invites the viewer to inhabit a tunnel-like space as one might if shrunken and placed inside of a whale…a tomb…an underwater cave. The space itself is a passage, momentarily transfixed by its current place in time. Connections can be made between the physical body and the sculptural object. Objects are imbued with their own unique appeal and have no shame in their boldness. The sculptures are layered, worn and seem to have lived once before, an alternate existence with different meanings. The artist is inviting her viewer to a place, vulnerable yet unafraid, to stay true to oneself. Further, she aims to provoke them to consider their own relationship between the objects and themselves. The materials are intuitive and subconscious, as if they have chosen her. She exists in a space surrounded by objects, ranging in form and meaning, some functional, discarded; some found or gifted; pocketed; purchased; created. Tabatha hopes to transcend medium, and places no limitations on object or substrate. She uses these forms as prosthetics to aid her and her viewer’s experiences of passage, captivity, and exploration. 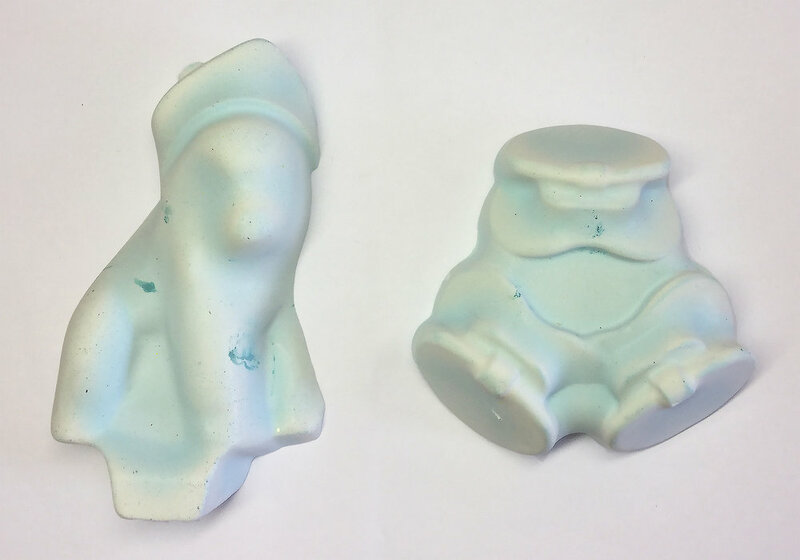 seawiid is "an installation by Nat Olmo using remnants of sludgy trashwater environments to explore accumulation as adornment and attempt to discover connections between artificiality and a traditional sense of 'real' or 'natural'." Exhibition Statement: A pool of ambient information encompasses us; I unconsciously and consciously filter and sample from that expanse. There is a magnetic accumulation of notions and material that impress upon me about place and person. This new work is that amassing of materials, both physical and in thought, that spawn from my relationships with art, art history, people, structures. 500X Gallery, Texas’ oldest, artist–run, cooperative galleries, hosts one of North Texas’ most anticipated annual juried competitions. This years juror is Sara-Jayne Parsons. As the Director of the Art Galleries at TCU in Fort Worth, British curator Sara-Jayne Parsons drives the international vision of Fort Worth Contemporary Arts and promotes professional development of students and local artists through programming in Moudy Gallery. Her curatorial practice is informed by working in collaboration or close partnership with artists to produce new art works through commissions, exhibitions and artist residencies. Artists she has worked with in this way include John Akomfrah, Ayman Baalbaki, Sonia Boyce, Jyll Bradley, Sebastiaan Bremer, Gina Czarnecki, Hew Locke, RAWIYA, Janek Schaefer and Emily Speed. Before moving to Fort Worth in 2014 Parsons was the Exhibitions Curator at the Bluecoat in Liverpool, UK, where for eight years she produced a diverse, contemporary exhibition programme. In that time she was also a collaborative member of the curatorial team for the Liverpool Biennial (the largest international contemporary art festival in the UK) and produced notable commissioned works by Daniel Bozhkov, Khalil Rabah, The Royal Art Lodge and Ranjani Shettar. She has also published critical writing in various contemporary art magazines including Source, Art Monthly Australia and ArtLies, and has published essays in numerous exhibition catalogues. 500X is ready to start the new season with the annual members show. Welcoming the addition of it's newest members, this group of emerging Texas artists will be showcasing a range of media investigating a variety of content and formal concerns. Kalee Appleton, Clint Bargers, Lynne Bowman-Cravens, Molly Dierks, Ross Faircloth, Chris Ireland, Steven Foutch, Seth Lorenz, Valerie Powell, Justin Strickland-Hoff, James Talambas, Tabatha Trolli, Tony Veronese, and Ashley Whitt. As the oldest artist run co-op in Texas, the idea of collaboration, finding fresh talent and building community is what this current group hopes to continue to foster. Come out and help us kick off the 2017 season! We Made Cool is a body of work by Ari Brielle that examines notions of black femininity, strength and softness. Candy painted colors and natural motifs decorate portraits that explore black culture, consumption and experience. Ari Brielle is an emerging visual artist based in Dallas, Texas. She completed her BA at the University of North Texas in 2016 where she cultivated her studio practice and studied Interdisciplinary Art and Design. Brielle has exhibited in Texas and New York, and was recently nominated as one of Dallas’ Rising Stars by Liliana Bloch Gallery. Bárbara Cartier energetically explores the tricky territory between painting and sculpture using a variety of materials and methods to create sculptural forms reminiscent of organic objects such as eggs and river rocks. Her use of vibrant colors and silky smooth surfaces suggest a “new car” seduction; polyurethane and fiberglass forms become outsized shining gems, transformed by hand and machine resulting in an ornate illusion of weight and volume. Teamed with collages, these totemic forms challenge decoration in a playful manner to create a kaleidoscopic installation intent on alchemy. Born in Argentina, Bárbara Cartier now lives and works in Panama. Featuring new sculpture and collages, A Call From The Center of Things will be her first solo exhibition in the United States. This exhibition is sponsored by the Art Galleries at TCU. Curated by Gundula Schmitz (Laura Mars Gallery) and Gary Farrelly. Chris Dreier (DE), Christine Weber (DE), Cunningham Architects (TX), Dirk Krecker (DE), EVOL (DE), Gary Farrelly (IRE/BE), Julia Zinnbauer (DE), Laure Catugier (DE/FR), Matias Bechtold (DE), Oisin Byrne (IRE/UK), Pádraic E. Moore (IRE/BE), ScAle Architects (IT) and Tannhäuser Tor (Alekos Hofstetter (DE) & Florian Göpfert (DE). A hard place brings together work by artists and architects from Germany, Ireland, France and Italy as well as a piece by Dallas’s Cunningham Architects produced especially for the show. A unifying concern in the work is the legacy of post-war modernist architecture. The artists of a hard place employ highly divergent strategies across a wide variety of media to explore the theme. The exhibition includes video art, photography, drawing, painting, textiles, sculpture, sound recordings and the written word. In post WWII Europe new civic infrastructure such as housing, factories and administrative facilities had to be erected on an unprecedented scale. Commonly known as Brutalism, the style that emerged was characterized by repeated modular elements articulated and grouped together into a stark, unified whole. Cast concrete was used for its raw and unpretentious honesty and structural integrity. This new architecture constituted a forceful rejection of preceding political, social and economic thinking. The buildings symbolize the optimism of high modernism. Moreover, they might also be viewed as an affirmation of mankind’s ability to create, improve and reshape the world via practical experimentation, scientific and technical knowledge and human cooperation. Today, the progress orientated stance and towering utopic mission of post-war modernism is subject to much criticism. The remnants of the defunct modernist project are ever present in the form of neglected edifices that prevail upon our cities and towns. Without a living transformative ideological project to substantiate their presence it is not clear what our responsibility towards the buildings and the ideas they represent should be. Some of the artists have a very emotional / euphoric relationship with architecture. They adopt a caretaking posture casting themselves as faithful guardians of modernism's legacy. Others take a cynical stance and consciously disavow the naivety and idealism of post-war architecture. And there are those who stake out nuanced, idiosyncratic positions between these two poles. However, in the work of all participating artists in-depth research plays an eminent role. The city of Dallas, with all its skyscrapers, elevated roadways, hub airports and subterranean tunnels serves as the ideal venue for this exhibition.